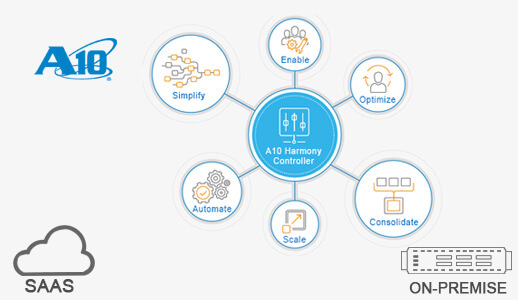 Core to the A10 Harmony platform, the A10 Harmony™ Controller delivers centralized management and analytics for secure application services in any underlying infrastructure - from traditional on-premise environments to public, private and hybrid clouds. The A10 Harmony Controller integrates management and analytics for A10 secure application services. The controller manages A10 application delivery controller (ADC) instances* and other A10 services that implement and enforce policies. The solution collects, analyzes and reports on traffic flowing through A10 Thunder,** Lightning ADCs and open-source third-party platforms,** including HAProxy load balancers. The centralized visibility and intelligence derived from per-app analytics greatly increases operational efficiency. The controller is centrally deployed and resides between the administrators and distributed A10 Thunder and Lightning application services - such as load balancing, application delivery and Web application firewall - for complete policy management, configuration and control functions. With the Harmony Controller, organizations can increase operational efficiency and agility, enhance end-user experiences and reduce TCO. Simplify the management of distributed application services to dramatically shorten troubleshooting times, receive alerts on performance or security anomalies, improve capacity planning and optimize IT infrastructure for elastic cloud environments. In an elastic and distributed environment, managing policies for application services separately can be complex, time-consuming and error-prone. The controller presents an easy and centralized way of configuring and managing policies across applications deployed in data centers or across private and public clouds. The controller helps optimize various software-based instances throughout deployments and enables elastic scaling of services if the underlying infrastructure provides those capabilities. It continuously monitors the health of these app services, traffic patterns and app server-scaling to ensure high service availability. The controller’s provider-tenant architecture allows a central IT team to function as a provider with control and visibility while allowing self-service for the tenant app teams. This multi-tenancy design enables IT teams to offer software-as-a-service (SaaS) to their internal or external customers. The tenants can easily provision infrastructure and maintain control with per-app policies. The controller continuously collects metrics on a per-app basis, consolidates and correlates them in a ‘big data repository’ and provides actionable intelligence. Administrators gain a unified view of the distributed application environment, including multi-cloud scenarios, and obtain detailed reports including performance, end-user experience, security levels and server health. With 100 percent RESTful API coverage, all application services are programmable and enable automation and integration with DevOps processes. The services can be integrated with orchestration tools such as Ansible, Chef and Puppet and CI/CD tools, including Jenkins. The controller’s microservices design delivers highly available and scalable control and analytics functions. The controller deployment can be scaled without service disruption or replacing software as required by appliance-based approaches. The Harmony Controller may be deployed via a SaaS model. Secure application services, such as Lightning or Thunder services, are purchased separately. Only control messages, metrics and telemetry data are sent between the controller and service instances via a secure SSL-encrypted channel. Application traffic does not flow through the controller. This ensures application data remains within the customer’s network. Reduce Total Cost of Ownership: Since it’s managed by A10, no operational resources are needed to deploy, operate, monitor or upgrade the controller software. Accelerate Deployment of Application Services: Organizations may obtain an account for the controller and start utilizing cloud-native application loadbalancing, security and analytics capabilities in just a few minutes. In this scenario, the controller is deployed and managed under the control of the organization, within their on-premise data center, private cloud infrastructure or public cloud service. The controller software license includes the Harmony Portal and Harmony APIs for interfacing and management. The secure application services, such as Lightning or Thunder services, are purchased separately. The decoupling of the controller and the underlying application services provides several advantages. Allow IT to Retain Complete Infrastructure Control: or various internal security needs, regulatory requirements and other factors, organizations may require full possession of the controller along with the application services. Support Broader, More Flexible Deployments: The Harmony Controller can be deployed in the data center and network location most appropriate for the organization. Regardless of deployment location, it provides centralized management of multiple application services, across multiple public and private clouds, with full visibility and analytics. Available as a service, the cloud-based controller subsystem is fully managed and monitored by A10. The controller is hosted and provided from data centers in the United States. It is built on top of a hardened operating system, installed on one or more highperformance, industry-standard servers and hosted at a public cloud provider. The controller is in an isolated environment with networklayer ACLs and access is granted only to authorized personnel. Data exchanges within the subsystems are encrypted using strong ciphers and sensitive data like passwords; SSL private keys are stored in the database with strong encryption. External access is always through industry-standard SSL communication. The A10 Networks team runs regular security scans and audits for security vulnerabilities. The controller offers multiple layers of security that are reviewed to ensure security and compliance. The controller may be optionally deployed within an organization’s on-premise data center, private cloud or in a private domain of a public cloud like Amazon Web Services (AWS), Google Cloud Platform or Microsoft Azure. The self-managed controller is distributed as software that can be installed on any physical or virtual machine running CentOS 7.x operating system. Please contact A10 for additional details. Thunder TPS supports an industry standard CLI, on-box GUI and the aGalaxy management system. The CLI allows sophisticated operators easy troubleshooting and debugging. The intuitive on-box GUI enables ease of use and basic graphical reporting. aGalaxy offers a comprehensive dashboard with advanced reporting, mitigation console, and policy enforcement for multiple TPS devices. The A10 Harmony Controller is available in two deployment models. The first allows organizations to use it as a SaaS offering managed by A10 - making it very simple, quick and cost-effective to consume. 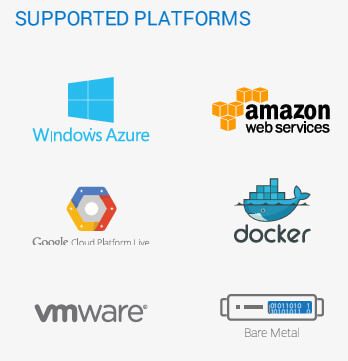 The controller is also available as a customer-managed, scalable software solution within a customer’s environment in data centers or clouds, including VMware-powered clouds, Amazon Web Services, Google Cloud Platform and Microsoft Azure. Copyright 2019 © Optrics Inc. All Rights Reserved. All Registered Logos and Trademarks displayed on this site are the property of their respective owners.